Tom Joyner Host "Celebrities With a Purpose"
Tom Joyner hosted “Celebrities with a Purpose” in Beverly Hills Saturday night prior to the Grammy Award Show. The event marked the 10th anniversary of his series of Ultimate Cruises for listeners that raises money for his Tom Joyner Foundation. 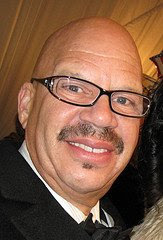 The Tom Joyner Foundation has generated $55 million for scholarships to historically black colleges, and has helped put 14,000 students through school. "Tom Joyner Foundation has generated $55 million for scholarships to historically black colleges, and has helped put 14,000 students through school." That comes out to less than $4000 per student, hardly enough to put any child through primary school, let alone college. That begs the question of how much he really raises and how much is kept for "administrative" costs. Also, what does he mean by "generated"? I would love to see which sets of books he allows the outsider to view. Too many people like to "help themselves" before they help others. Does he only raise the funds, or does he take some of his salary and the salary of the jocks he keeps out of work by syndicating his show, and donates as well?